During my 30+ years working with the human body, I've sifted through hundreds of types of skin treatments to arrive at what works best. There are a lot of 'wonder treatments'out there, and as you've probably learnt by now, most of them are just hype. That makes it difficult for people to decide on the best type of Skin Rejuvenation treatment to suit their needs. Every client's skin has a different story to tell and different problems to resolve. Reef has a comprehensive range of treatments to draw upon, depending on the type of skin condition you wish to treat. Some places offer feel-good menus that promise the world and achieve very little. I'm not into that - This isn't a day spa. I want to get a result for you. I want you to look in the mirror in a week's time and feel happier about your appearance. So, before we begin a treatment, we'll talk. Book in for a consultation and I'll sit down with you to determine exactly what you want to achieve. Below, I've listed the different types of Skin Care treatments I offer at Reef, what they're used for, and how they work. There's no marketing mumbo jumbo or magical promises. Just science. I hope that this helps remove some of the mystery and confusion about Skin Rejuvenation treatments and lets you make an educated decision. If you would like to discuss your skin or wish to book in for an obligation-free skin consultation, please give me a call on 49267778 or use the online form on the contacts page. Diamond Microdermabrasion is the starting point for most skin treatments at Reef, as it prepares the skin, leaving it clean and receptive for other procedures. It can also be used as a standalone treatment. Reef only uses Diamond Microdermabrasion - definitely not Crystals. 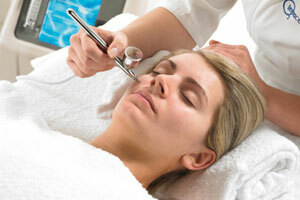 Crystal Microdermabrasion tears at your skin with microscopic glass-like shards called silica. Not surprisingly, this is quite painful and your skin can look awful for weeks or even months afterwards. By comparison, Diamond Microdermabrasion is painless, relaxing, and completely non-invasive. Instead of attacking your skin with foreign particles, our diamond heads respect your skin's integrity, using light abrasion with variable vacuum pressure to remove dead skin cells, soften lines, and unblock pores. As a standalone treatment, your Diamond Microdermabrasion session will begin with cleansing to remove any makeup, and afterwards, will finish with Intraceuticals CO2 moisturiser and binding cream to retain moisture for the rest of the day. Even if you are just having a Diamond Microdermabrasion treatment on its own, your skin will feel much lighter and very fresh. The key word here is Hyperbaric, as most salons that offer "oxygen infusions' are merely blowing serums onto the skin. In contrast, Hyperbaric Oxygen Infusions force oxygen, which is vital to collagen renewal, and nutrients deep into the skin. A powerful treatment yet ultra relaxing, our hyperbaric oxygen system produces 100% medical grade oxygen at 1.5 atmospheres of pressure. Reef uses the Intraceuticals oxygen delivery system, the same system used by surgeons to deliver chemotherapy to skin cancer patients. Reef's Hyperbaric Oxygen treatments vastly increase your skin's ability to absorb oxygen. Used in conjunction with the highest quality CO2 serums, it delivers hydrating nutrients, antioxidants, hyaluronic acid, and vitamins deep down for longer lasting results. Immediately, your skin will be noticeably firmer, your pores will be smoother, and your face shape will be softer and more full. And unlike normal facials, the results don't end there. The nutrients go very deep and you will see their effects in the weeks that follow as well. Atoxelene is used in conjunction with one of the other three serums. It is a needle-free Botox alternative that helps soften wrinkles and expression lines. Prices for Rejuvenate, Opulence, and Clarity serum infusions are the same, and include Diamond Microdermabrasion beforehand. Atoxelene is an add-on serum. The cost is $30 extra. Radio Frequency treatments (commonly called "RF") are designed to help smooth out the surface of your skin. Reef uses two types of RF; tri-polar for facial areas, and multi-polar for larger body areas. RF sends radio waves through the skin to heat up the collagen bed deep beneath your skin. This procedure helps straighten the collage fibres in the dermis, which in turn reduces wrinkles and scarring. RF treatments can be beneficial in treating frown lines, wrinkles, cellulite, stretch marks, and acne scarring. As the treatments are affecting new skin layers, the effects of the treatment are not immediate, but will be evident 6 to 8 weeks following your treatment. Due to the heat component of RF, treatments can be moderately uncomfortable but should not be painful. A series of 6 RF treatments a fortnight apart is recommended. Prices will vary for RF treatments, depending on the area size and the depth of wrinkles in the area. IPL or Intense Pulsed Light is a broad spectrum technology that is used in many beauty procedures, which are collectively referred to as Photo Rejuvenation. The term basically means 'to make your skin look younger using light'. Common issues treated with IPL include freckles, uneven skin tone, broken capillaries, and fine lines. Photo Rejuvenation treatments can be tailored to treat one or several conditions during the one session. IPL Photo Rejuvenation treatments can be mildly uncomfortable but are not be painful. Some skin pinkness can linger for a few hours afterward. For Pigment and Collagen treatments, 4 to 10 treatments are recommended, either a fortnight or month apart. Diamond Microdermabrasion is strongly recommended ahead of a Pigment treatment. Capillary treatments are best performed weekly. Largely dependent on the age, size, and depth of the spider veins, some people find that a few treatments achieve the desired result, while other clients require more. Prices for IPL Photo Rejuvenation treatments vary widely depending on the area and conditions that we're trying to treat. A consultation is always performed before treatment and a price will be determined before we commence. This treatment is designed to treat live acne outbreaks, not scarring from past outbreaks. 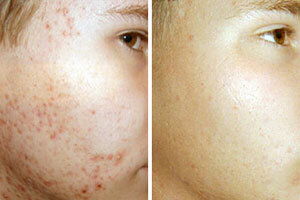 If you want to treat scarring with IPL, refer to the IPL Photo Rejuvenation section above. IPL Live Acne uses the same base technology as Photo Rejuvenation, however the acne virus only responds to a very specific wavelength of light; 420 - 440nM. 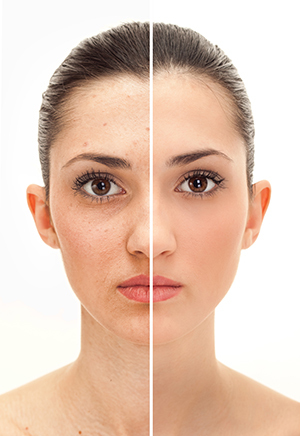 Additionally, normal IPL Photo Rejuvenation machines are largely ineffective against acne bacteria. This is because they emit a blue light which targets the epidermis, while acne requires a yellow light in order to penetrate the skin effectively. For those reasons, we treat IPL Live Acne treatments as a separate procedure. It uses a special bulb to general yellow light while maintaining the correct wavelength. IPL Live Acne treatments look for porphyrin, a compound inside the acne virus. Effectively targeted, each porphyrin cell releases a single oxygen molecule which is fatal to the virus. IPL Live Acne treatments are most effective after a Diamond Microdermabrasion treatment, which will help clean away the pus and debris from the area, thus allowing the light to more easily find its target. A series of Live Acne treatments will be required. During your course of treatments, and for one month leading up to your first treatment, you cannot take Roaccutane or antibiotics that contain tetracyclines, e.g. Minomycin, Doxycycline, or Minocycline. A consultation is required before we can quote a price, which will be dependent on the size of the treatment area. Live Acne treatments can be mildly uncomfortable but are not painful. You also have other alternatives to IPL Live Acne, such as a Hyperbaric Oxygen Infusion with a Clarity serum.